Today we celebrated The Passion, Death and Resurrection of Jesus. 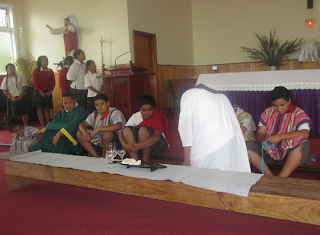 We had a Liturgy performing the last week Jesus had on earth. He died on the cross for us. The mass was very organised and there was beautiful singing. I was a Narrator. I enjoyed the mass today because it was very wonderful. Fr. Ioane joined us for the Liturgy.